Petrol Station Accident Claims – Forecourt Slip Trips – How Much Compensation Can I Claim? Petrol stations can be dangerous places, with cars moving around constantly as well as pedestrians, as they go to the counter to pay for their fuel. It is no wonder therefore, that people are injured in these busy places. Slips on petrol forecourts can cause a variety of injuries, but you may be able to claim for compensation if the accident you’ve been involved in is not your fault. What is a petrol station forecourt slip, trip or fall? What can be claimed for after a petrol station forecourt injury claim, or slip, trip or fall? How much compensation will I get after a petrol station forecourt slip, trip or fall? Why choose us as your claims service for a petrol station forecourt slip claim? With cars and pedestrians constantly coming and going at all hours of the day and night, petrol stations are the site of many accidents. Any place such as this can harbour risk of an accident occurring, but if you have been injured in a petrol station forecourt slip, then it may be possible for you to claim compensation for any injury you have suffered. You may also be able to claim for as essential costs such as medical bills and lost income, to ensure you don’t end up financially worse off due to an accident that was not your fault. 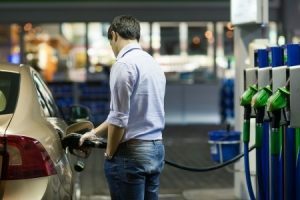 Here, our guide to petrol station forecourt slip accidents reveals all you need to know about what to do if you are ever in the unfortunate situation of suffering injury due to a petrol station forecourt slip, whether at work or as a customer. One of the most common reasons for people to suffer injury in a petrol station forecourt is because of spilled fuel. Spilled petrol can be incredibly slippery and it is no wonder that people struggle to stay on their feet if they accidentally step on spilt fuel. Whilst the spillage in itself may have been an accident, it is the duty of petrol station staff to ensure that spillage reports are acted upon immediately as they are reported before falls on petrol occur. They must be cleared up quickly, and signs must be in place to warn customers if the spillage cannot be removed straight away for some reason. If a customer were to slip on the forecourt due to the negligence of staff who have been told about a spillage but failed to correctly deal with the issue, then the customer may be in a position to make a claim for compensation for their injuries. Whilst you may be in some pain after your accident in a petrol station, it is essential that you take the following action to preserve details of the event and any costs you have had to pay because of your injuries. Get witness details – If anyone was around when you had your petrol station forecourt slip, trip or fall, it is a good idea to take down their name, address and contact number. A witness statement can help present a strong case, and whether the witness has seen a petrol spillage prior to your accident, or witnessed the actual fall, this could be crucial evidence of what has occurred. Take photos – Most mobile phones have cameras these days, so it should be quite easy for you to take photographs of not only the scene of the accident but also any visible injuries you have incurred as a result. Keeping a photographic record can make for a stronger claim. Take vehicle/driver details – If there was another car involved in your petrol station accident claims, it is vital that you take details such as the make and model of the vehicle, and the drivers contact details. Keep receipts – Whatever costs you have incurred as a direct result of your petrol station forecourt slip, make sure you keep a record and whatever documentation you receive, such as receipts, appointment cards for medical treatments and medication receipts. This will help you to prove what costs you have had to pay prior to your claim, so it is essential that you do not throw any of this important documentary proof away. In order to make a petrol station compensation claim, all you really need to do is to call us. Our experienced staff are used to dealing with cases just like yours and we will do all that we can to make the process straightforward and as stress free as possible. Initially, we will take you through a free consultation, where we will listen to your account of what has happened, whether it concerns slips on petrol or any other incident, asking questions to get all the facts surrounding the incident. You may also be required to attend a medical appointment locally, where a doctor will assess your injuries and provide a written report of your condition. Once we have completed this process, we will have much more of an idea of how strong your case is and be able to advise you accordingly. As part of our No Win No Fee service, you will not have to pay a penny of your own money upfront, as we won’t charge you at all unless your case is successful. Whether you work behind the counter of a petrol station, or work on the forecourt itself, it is still possible for you to make a petrol station injury compensation claim if you have suffered an injury/injuries as a result of a petrol slips, trips or falls. If someone else has failed in their duty to clear up a petrol spillage, or if your employers have failed to ensure your health and safety are taken care of with proper risk assessments and risk management procedures, then you may wish to pursue a claim for compensation. If you are worried about whether this would affect your job, it is important that you understand that your employer, by law, cannot discriminate against you or treat you differently because of your claim. In addition, your employer will have insurance in place to cover the costs of any successful claim. We have dealt with thousands of claims against employers and can talk you through the process so that you are comfortable with the course of action you are taking. Don’t forget too, your employer has a legal duty to keep you safe at work, and taking action may mean accidents are reduced, making the workplace a safer place to be for everyone. Whilst it may seem like you drive past many petrol stations in the course of your commute, the fact is, the number of petrol stations has declined, from more than thirty thousand in 1970 to just short of 8500 in 2016. They have been closing at a rate of three hundred per year, although this rate has begun to stabilise in recent years. This decline is said to have been due to increasing costs with complying with new and improved environmental laws as well as the costs of fuel itself. Supermarket petrol stations, however, appear to be on the rise, with their ownership of 18 percent of the country’s petrol stations netting them 45 percent of the total market share in the country. The falling number of petrol stations in the last 40 years has made for a larger volume of traffic per petrol station, thereby increasing the risk of accidents on petrol station forecourts. You may be wondering what it is you can claim for if you’ve been injured in a petrol station slip, trip or fall accident. Whilst every case is different, in terms of the severity of the injury and type of accident, an award for compensation can usually be broken down into the following types of damages. Loss of earnings – If you have been unable to attend work or carry out your job due to your injuries, both mental or physical, then you may be able to claim compensation for your lost income. Travel Expenses – If you have been required to attend medical appointments and incurred travel costs due to this, then you should be able to submit a claim for travel expenses. General Damages – Finally, this is the amount of money awarded to you to compensate for the suffering and pain you have endured. Whether your accident was one of the more common as listed above, or something entirely different, if it is not your fault, you may be able to make a claim. Simply call our team and we will talk you through what injuries can be claimed for if someone else’s negligence has caused your injuries, whatever the accident. Whilst every case is assessed on its own merits, and each client is as unique as they next, we know that you will want some idea of how much compensation you are likely to receive for your petrol station forecourt accident. This is why, for your benefit, we have put together the following compensation table in order to illustrate the most common award brackets for injuries pertaining to slips, trips and falls on petrol station forecourts. If your injuries do not appear in this table, do not hesitate to call us. We have a wealth of information and experience at our fingertips and will be able to give you a more in-depth idea of what compensation you may be successfully awarded after having a brief conversation about your specific injuries and the accident itself. Pain & suffering £1,000 - £200,000 The level will depend on how much suffering and pain it is deemed you have gone through. Anguish (Mental) £3,550 If you have experienced expectation of the end of your life or have been fearful of death, you may be awarded this. Neck Injury (Severe) £42,550 - £112,750 Ranging from the lower point, which covers soft tissue damage (severe) or dislocation/fracture. Permanent quadriparesis (spastic) or paraplegia (incomplete) are likely to see awards of the higher point. Neck Injury (Minor) A few hundred pounds - £6,000 This will be awarded based on the assessment of how much pain relief has been required, the prognosis for recovery, and how severe or long lasting the pain and injury are. Neck Injury (Moderate) £6,000 - £19,000 Severely painful/debilitating fractions and dislocations are covered in the higher end of this bracket. Lower awards for those injuries that have exacerbated previous injuries or conditions. Clavicle Fractures £3,000 - £9,300 Award will take into account the longevity of any injury, how severe the fracture is and how permanent the disability is, and the pain experienced. Leg injury (Severe) £21,100 - £103,250 Cases that are just short of requiring amputation are usually near the higher end of this bracket. Lower awards pertain to crush injuries and complicated fractures..
Leg Injury (Non Severe) Up to £29,800 Fractures with incomplete recovery are at the top end of this bracket whilst simple fractures that require recovery within a few months sit at the lower end. Minor injuries A few hundred pounds - £525 Recovery possible within a week. Benefit Loss £5,000 - £500,000 Actual income lost while in recovery. It is possible to be awarded more than the maximum here in some cases. Loss of anticipated earnings £10,000 - £400,000 If an extended period of recovery causes you to miss work, it is possible to make a claim for future earnings, which should also take into account possible earning potential pertaining to promotion, etc. Due to this fact, it is also possible for your award to outweight the maximum states payout listed here, especially if you perform a highly skilled/paid job. When it comes to making a compensation claim for your petrol station forecourt slip, trip or fall, by using our service you won’t have to pay any money up front. We operate a No Win No Fee policy, which allows everyone, irrespective of their personal financial situation, to pursue a claim for compensation without being left out of pocket. In addition to this, there will be nothing to pay in the event that your claim is unsuccessful. Our No Win No Fee service means exactly that. If your case is not won, you don’t have to pay legal fees to us. This not only ensures that you won’t be left financially worse off for pursuing a claim, it also means you can be sure we will only take your case on if we feel it is strong enough to win. If, for any reason we feel that your claim is not strong enough, we will tell you honestly, so that you are not wasting time pursuing something with very little chance of success. If you would like to know whether your case is likely to be successful, we can examine the details as part of a no obligation consultation. Simply call us to get started. With years of experience handling petrol station claims, we know how overwhelming dealing with the after effects of an accident are. The last thing you want is for the claims service you choose to make things harder, and this is why we work hard to ensure that the process is as straightforward as it possibly can be. We make it easy for you to attend a medical locally to you, so that you won’t have to travel too far, and we deal with every aspect of your claim with dedication and attention to detail. This has helped thousands of our clients receive the maximum compensation possible for their injuries, which is why many of them have recommended our services to others. With our No Win No Fee service, you’ll be confident that you won’t be left out of pocket for pursuing a claim with us, as there will be nothing to pay if your claim were, for some reason, to be unsuccessful. Finally, your free initial consultation is no-obligation, so we will not push you into making a claim should we feel it is not in your best interests to do so – truly putting you and your needs first. If, having read this guide, you feel that you may have reason to pursue a claim for compensation following a petrol station forecourt accident, then call us today on 0800 073 8804. Our experienced, sympathetic team will take you through some initial questions before advising on the best course of action for your claim. You can be sure that we will handle your claim as efficiently and as sensitively as possible, making the claims process as easy as possible. Whether you’ve been injured in a petrol station at work, or as a customer, then why not get in touch to see how we can help you make a claim for compensation for your injuries. The HSE has put together a guide for petrol station workers and owners in order to help them keep those using their premises safe. The HSE’s current legislation for petrol station owners concerning petrol forecourt safety including changes is found here. If you have suffered a slip, trip or fall outside of a petrol station, or would like to know more about slips, trips and falls and what can be claimed for, our guide contains all you need to know. If a wet floor has caused your slip, and you’d like more in depth information about this type of injury and compensation claim, then read our informative guide.